54 | TH E M R EP O RT O R I G I NAT I O N S E R V I C I N G DATA G O V E R N M E N T S E C O N DA R Y M A R K E T THE LATEST GOVERNMENT THE LATEST Industry Responds to President Trump's Dodd-Frank Order While some look forward to the possibility of a more simplified regulatory environment, others feel a possible pullback of Dodd- Frank is a "betrayal" to consumers. P resident Donald Trump's executive order demand- ing an official review of the Dodd-Frank Wall Street Reform and Consumer Protection Act is his first real step toward fulfilling a promise he made in his campaign to overhaul the banking rule. The executive order, which President Trump signed in early February, will direct the Treasury secretary to consult members of different regu - latory agencies and the Financial Stability Oversight Council, and report back on potential changes. Several members of the industry voiced their approval for the presi - dent's order, while others expressed concern and called for caution. 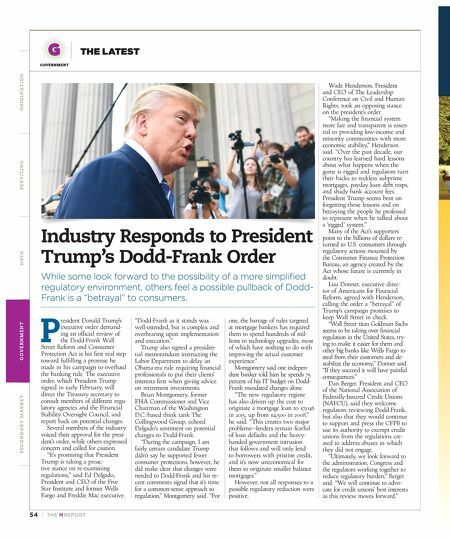 "It's promising that President Trump is taking a proac - tive stance on re-examining regulations," said Ed Delgado, President and CEO of the Five Star Institute and former Wells Fargo and Freddie Mac executive. "Dodd-Frank as it stands was well-intended, but is complex and overbearing upon implementation and execution." Trump also signed a presiden - tial memorandum instructing the Labor Department to delay an Obama-era rule requiring financial professionals to put their clients' interests first when giving advice on retirement investments. Brian Montgomery, former FHA Commissioner and Vice Chairman of the Washington D.C.-based think tank The Collingwood Group, echoed Delgado's sentiment on potential changes to Dodd-Frank. "During the campaign, I am fairly certain candidate Trump didn't say he supported fewer consumer protections, however, he did make clear that changes were needed to Dodd-Frank and his re - cent comments signal that it's time for a common-sense approach to regulation," Montgomery said. "For one, the barrage of rules targeted at mortgage bankers has required them to spend hundreds of mil - lions in technology upgrades, most of which have nothing to do with improving the actual customer experience." Montgomery said one indepen - dent banker told him he spends 75 percent of his IT budget on Dodd- Frank mandated changes alone. "The new regulatory regime has also driven up the cost to originate a mortgage loan to $7,046 in 2015, up from $4,500 in 2008," he said. "This creates two major problems—lenders remain fearful of loan defaults and the heavy- handed government intrusion that follows and will only lend to borrowers with pristine credit, and it's now uneconomical for them to originate smaller balance mortgages." However, not all responses to a possible regulatory reduction were positive. Wade Henderson, President and CEO of The Leadership Conference on Civil and Human Rights, took an opposing stance on the president's order. "Making the financial system more fair and transparent is essen - tial to providing low-income and minority communities with more economic stability," Henderson said. "Over the past decade, our country has learned hard lessons about what happens when the game is rigged and regulators turn their backs to reckless subprime mortgages, payday loan debt traps, and shady bank account fees. President Trump seems bent on forgetting those lessons and on betraying the people he professed to represent when he talked about a 'rigged' system." Many of the Act's supporters point to the billions of dollars re - turned to U.S. consumers through regulatory actions mounted by the Consumer Finance Protection Bureau, an agency created by the Act whose future is currently in doubt. Lisa Donner, executive direc - tor of Americans for Financial Reform, agreed with Henderson, calling the order a "betrayal" of Trump's campaign promises to keep Wall Street in check. "Wall Street titan Goldman Sachs seems to be taking over financial regulation in the United States, try - ing to make it easier for them and other big banks like Wells Fargo to steal from their customers and de- stabilize the economy," Donner said. "If they succeed it will have painful consequences." Dan Berger, President and CEO of the National Association of Federally-Insured Credit Unions (NAFCU), said they welcome regulators reviewing Dodd-Frank, but also that they would continue to support and press the CFPB to use its authority to exempt credit unions from the regulations cre - ated to address abuses in which they did not engage. "Ultimately, we look forward to the administration, Congress and the regulators working together to reduce regulatory burden," Berger said. 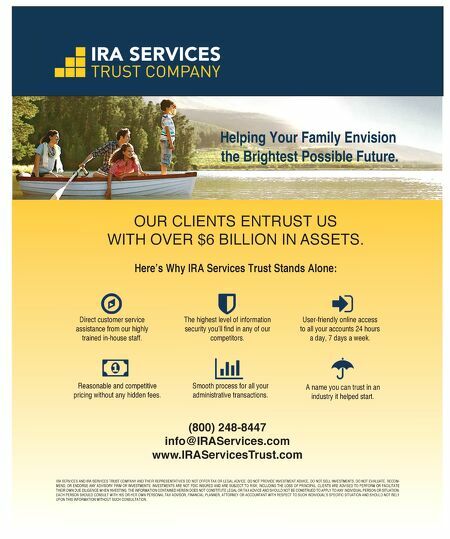 "We will continue to advo - cate for credit unions' best interests as this review moves forward."